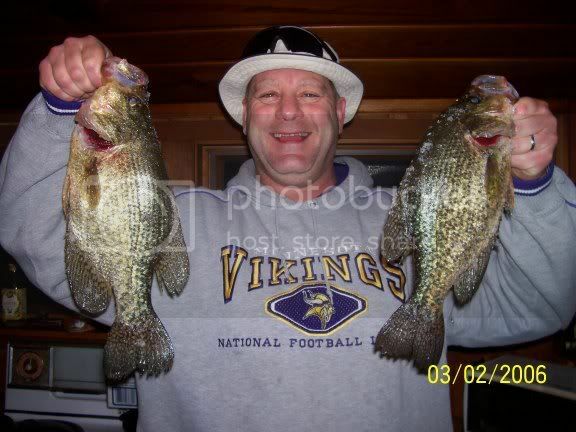 Posts 1 through 10 for I Love Miller Lite and HUGE Crappies. Had a very succesful trip to our "secret" honey hole last week. Did I say I Love Miller Lite!!!! At about 4:30 we setup shop in 21 FOW just off a 27 foot hole that is known to hold big fish, and lots of them!!! We Picked up a few eaters in the first hour which was a good sign and we thought it was going to be a good sunset bite but we only picked up 2 more and it shut off around 6:30 so we went to plan B which entailed drinking more Miller Lite!!! 2 of the guys that were with us took off to try their luck at the Casino, where as my friend Smooth and I stuck around knowing Crappies will often re-appear and go into an additonal later feeding pattern or in this case a FRENZY. We figured if we were going to stay out late and fish we would need some Energy to keep us going so we continued to drink Miller Lite "in moderation of course" at about 8:15 pm the Vexilars lit up like no tomorrow soon all 4 lines were down and the slaughter was on. Smooth was on fire in the blink of eye he had these 2 monster wall hangers on the ice, the one on left was just over 16" and weighed 2.2 lb's on my digital scale the one on the right was a shade over 15" but real fat and it weighed 1.90 both fish were measured with mouth closed and the tail pinched. We ended up catching 35 fish and keeping 18.
nice crappies i'd love to get into a few one of these days.. 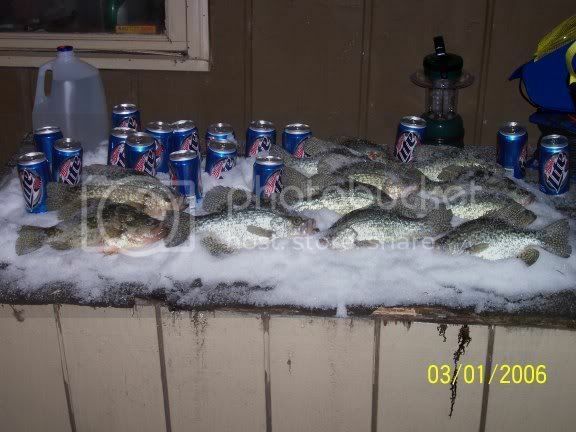 I like Miller lite and Crappies too, maybe next time I can tag along. It looks like you guys had a good time and a good buzz. Congradulations!! I tried calling you yesterday, give me a call when you get a chance. ps I see the big jug of water in the background, was our Reds smoking, vest wearing friend with you? Sure Webdude! Sorry about the party theme it was just one of those trips! No Bobber last I heard he was still in the witness protection program. Got the picture up on the homepage and the pics section. Thanks! Very nice crappies PierBridge! You care to share where?